The problem with gaming on a laptop rather than a desktop tends to be the slow processing speeds, and the fact that your lappie isn’t always equipped to handle graphic heavy programmes that use a lot of RAM. Well the next gen of gamers laptops are about to appear, and they’re in the Alienware family, famous for already producing cutting edge computers for gamers in the know. They’re describing the M17x rather optimistically as the ‘Most-Powerful 17″ Laptop in Universe’, but when you look at the specs it seems they may be telling the truth. Beneath the stylish chassis lies up to 8GB of DDR32 1333MHz Memory and a SSD that’s either single or dual up of up to 1TB. You’ll also get HD resolution with a 1920×1200 LCD screen and naturally the processors are very game friendly. You get the NVIDIA GeForce GTX 280M graphics processing unit, an illuminated keyboard to makes those battles in the dark easier to see, as well as a dual layer Blu-ray and DVD combo drive. Four USB ports are packed in there, along with an HDMI port, a VGA ouput and a card reader. 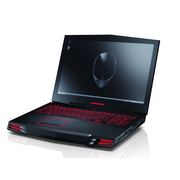 £1699 inc vat & delivery from Alienware soon. I seriously had to take a breather after looking at that.